Doing business online can not be denied an option the only one that often infatuate bloggers. Moreover, this selection statista supported by data released on its official website that noted that 40 percent of Internet users buying goods and services through online media. So very true, actually there is no excuse for not doing business online. But I'm sure my friend must wonder how to get started, let alone who had no experience at all going to panic and more puzzled. Now, there are a lot of miscellaneous businesses that often do business online virtual world. So stay my friend just choose which one suits him. Any kind of online business? A writer, entrepreneur, investor leading Japanese American descent Robert T Kiyosaki in his book cash flow quadrant describes four kinds of jobs that can bring in money. This quadrant is for office workers who always receives a reward for a job. Quadrant is intended for people who do the work based on a particular skill, such as doctors, musicians, lawyers. 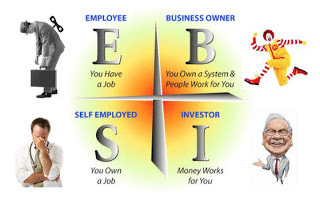 quadrant is specifically intended for people who have income without fatigue again he works (passive income). A simple example of the work that is buying and selling stocks, bonds or securities. Online business broadly divided into two major parts, namely the first to use the goods themselves (equity) and secondly that no alias using the products of others. For those who use the goods themselves, the shape can be a variety of products such as food, handicraft products, fashion products (shoes, clothes), agricultural products (fertilizers, pesticides, agricultural products), automotive products and much more. 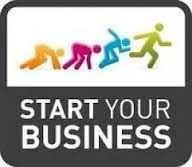 The first type of running an online business like this is very bright in need of capital money is not small. And this is not recommended for my friend who still have capital of less money. But in fact there is also a product that can mate with the cost of production alone would cost or almost no capital at all, but can reap the benefits. Examples are making photos and sold online. Many sites that receive the photos of you and want to give the yield on the work of my friend. But of course the photos in question are not haphazard, must be unique, quaint and inviting inspiration. If the first way they droop too buddy did, then the second choice to use other people's products. It means the products that we display in the account belongs to us is just a link leading to the site owner of the goods. So customers will know who the manufacturer of the goods. That is his own friend who posted the photo on his account products. So customers never know who the manufacturer of the goods. Buddy first requesting a list of items, including prices and photos to suppliers. After all the necessities obtained, pal promoting the goods channels blog, website or by social media accounts owned. When there are customers who are interested in buying then they would pay pal. The next task, buddy should inform those goods orders to suppliers, following the delivery address as well as his money. Manufacturers will send the item to the customer orders. For the type of affiliate reseller, you simply register it in the official website and then simply select the link which products will be on display at the site. So it is quite clear, in running an online business like this requires a high level of trust between suppliers and pal. When will the trust was undermined one of the parties, then get ready to plunge into the sea. Examples of such dropship system that has been widely practiced is the site amazon.com. olx.com, bukalapak.com, tokopedia.com etc. Make sure if my friend wants to use this dropship, the provider of goods or the supplier has a quality goods at reasonable prices. The most recommended is the provider of goods that speckle the least touched by the world of online business, so easy in the negotiation process will be. Business without risks if not paralyzed my memory is almost impossible to find. Likewise for the two types of online businesses as I have described previously, the risk is certain to be settled on both. When asked which of the two types of online business where the most desirable, the highest percentage is the number two (dropship). I think quite sane, if reversed an online business that we run will always be hoping to take advantage of the most abundant. Of course to get to the point that hope, one factor is determined by how much percentage of profit sharing as agreed by both parties. If my friend chose an affiliate reseller system then it is usually a percentage of profit sharing is already listed on the site when registering as a publisher. Such as amazon.com, the average offer a pattern for the product sales of 60: 40. Buddy will receive 60 percent of the total price of a type of product that is sold. Conditions for this result with an affiliate reseller system, you need to know is standard and can not be negotiated again. Unlike the case with the system reseller product, buddy still has room to negotiate the percentage of profit sharing. Generally the provider of goods or suppliers only allow my friend to take 10 s.d 20 percent profit from the price of the product. Online business has been practiced in the world of online marketing. The more sophisticated and current development of information technology, the inevitable has opened up opportunities for Internet users to conduct business online. Many also offer a way to do this online business of scale without capital or free up even should have initial capital first. Facts show the average internet user is more interested in doing business online with no capital at all. Indeed, the choice fell in the form of affiliate and reseller product reseller. Consider the risk business to be plausible reason why the two types of online businesses have taken the bloggers.